I am obliged to my client this morning who reminded me how easy it is when you work alone at home to keep busy doing multitudes of chores and busy work which just keep on coming back to be done over and over and which make no real difference to improving our lot. I was sitting here and thinking about this while doing precisely that, no easy topic had come to mind for today’s blog post so I was making some lunch, reaching out on Skype to a pal for a chat, answering the door to the postman, doing some laundry and so on, when what I really needed to do was to stop faffing about and just get on with it. When my client talked about those sorts of jobs which keep you busy all day, she said that she often ended up feeling that she had achieved precisely nothing. I reminded her about Stephen Covey’s Urgent/Important quadrant where jobs can be Urgent and Important or Urgent and Unimportant, or Not Urgent but still Important or – worst of all – Not Urgent and Not Important. I have a feeling it was this last one she was referring to. And I have a sense that it wouldn’t really matter if we never did those ones! The sky wouldn’t fall in. There’s usually one thing we could do each day which really makes a difference. We know that, but we don’t do it. We procrastinate and we self-sabotage. So what solutions did we come up with? It is important to say here that my client knew all the answers. She wanted to commit to some deadlines on two projects, she knew what they were, and she’ll be back next week to check in. Now she knows I’m watching (and caring) I suspect those’ll get done. No-one likes to come back next week and tell Teach we haven’t done our homework, especially that which we selected for ourselves using free will. And her other solution is something I know I could do even better with myself… couldn’t we all, especially at this time of year? It’s the ever present challenge of taking the best care of ourselves. Some form of daily ritual which becomes a habit, usually involving some exercise like walking or running or yoga, something spiritual like meditating or journaling, and something to do with way we eat, something which makes us more vital like juicing or eating for the way you want to feel, not the way you don’t. I usually manage two out of three, that exercise one being the most challenging in December. Still, I’ve got my new booties on, and I don’t rule out a stroll round this chilly block later today, before my next client at 4. 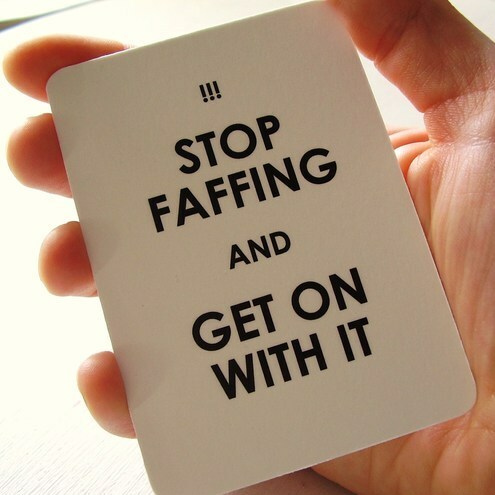 What do you do when you catch yourself faffing about? More of the same, or do you have a tried and tested strategy to get you doing the important stuff?